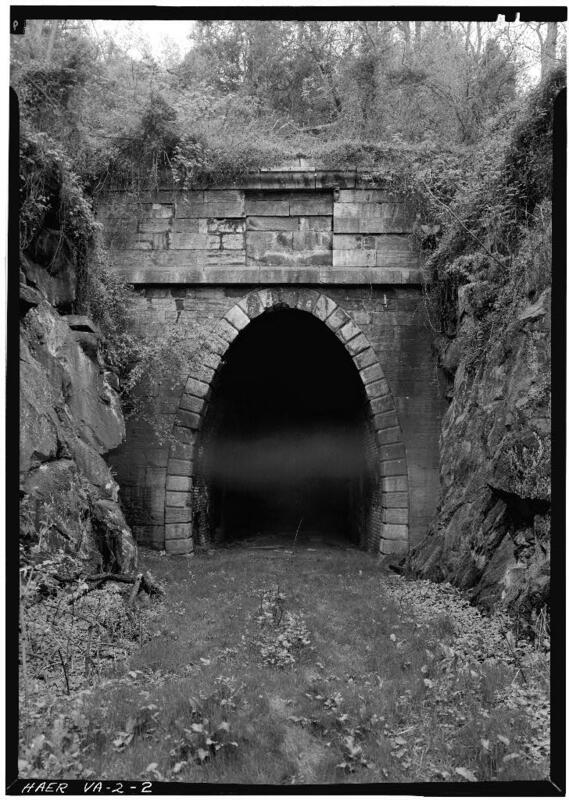 The Blue Ridge Tunnel was built by Claudius Crozet for the Blue Ridge Railroad in 1858 by the state of Virginia for the Virginia Central Railroad. It was the longest in the US at the time. Designated by the American Society of Civil Engineers as a Historic Civil Engineering Landmark. Stonewall Jackson and his troops used it to move quickly in Blue Ridge Mountains. His knowledge of the tunnels and gaps in the area and their speedy movement through them got them the epithet 'foot cavalry'. Jackson very wisely relied upon young officers with local knowledge in conducting his campaigns. He pulled them out of the line, listened to them carefully and kept them by his side until it was time to move to a new place. My lunch money says a local Lieutenant explained and showed this tunnel to General Jackson. Excellent pic, thanks for posting. It was replaced by another tunnel right next to it in 1944 and abandoned. There is a plan to use it for a rail trail but that is not finished yet. I love these sort of pictures, in fact any picture that shows abandoned railroads. What is a rail trail, I’m guessing that it’s similar to what we do with abandoned rail lines here in the U.K, we normally use them as cycle paths and nature trails. Also, what is that next to the track? And finally, I see telegraph poles and wires, are they left over from when the original tunnel closed. Great picture, many thanks for posting. I nearly forgot to ask about the height and width of the original tunnel, it looks small compared to other pictures that I have seen, was it a narrow gauge line? This pic from 'Tunneling, explosive compounds, and rock drills' by Henry S Drinker is of the Brookville Tunnel which was built by the same dude further down the line. 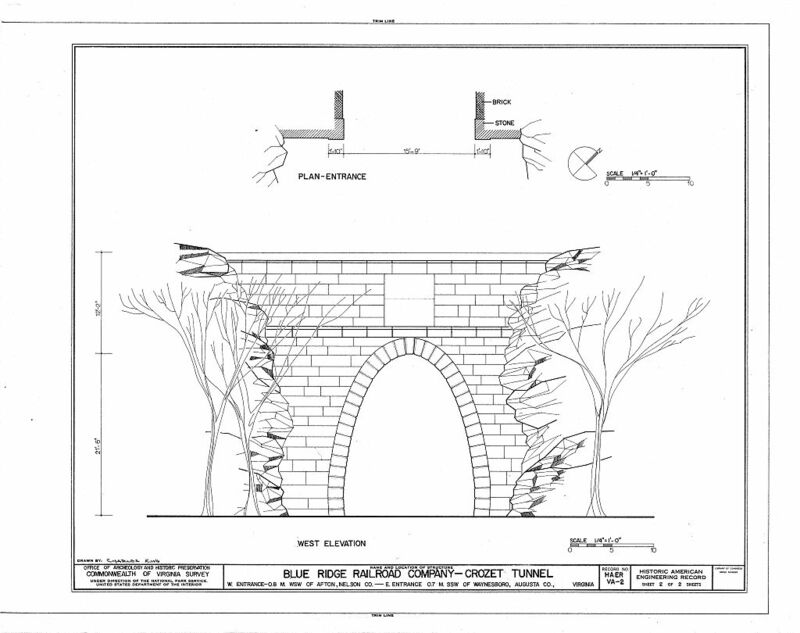 By the way, since the 'new' Blue Ridge Tunnel opened, the 'old' one is now known as the Crozet Tunnel after the builder. Very cool, great images and info! From what I can find, US Narrow gauge ran from 1' 11 5/8" to 3' 6". Most were started after the ACW. A lot of them were private industrial / mining / logging roads. From reading @DaveBrt 's web site, major southern roads preferred Standard Gauge or wider. Quantities of Work Jno. I W. Rutter. Richard Fox. John Kelly & Co. Jonas H. More G. B. Manby. The "new" still-used tunnel is deliberately out-of-frame at the left; note the W&A logo on the iron gate. Thanks for that, I can see from the diagram that the track gauge would probably be the standard 4ft 8 1/2 inches. I have to say that I’m pretty impressed with the quality of stone work, it wasn’t just thrown up, some thought went into the design, I think our own Isambard Kingdom Brunel would have approved of the work. If you like railroads then the chances are you find tunnels fascinating, here’s one of my favourite tunnels in the UK, designed by I.K. Brunel. Box Tunnel on the Great Western Railway. SkirmNotes: Cartridge Box Blues in 2010?